COMPACT FOOTPRINT: At about the size of a toaster, the ImageScan Pro 830ix takes up less space than a comparable ADF scanner. 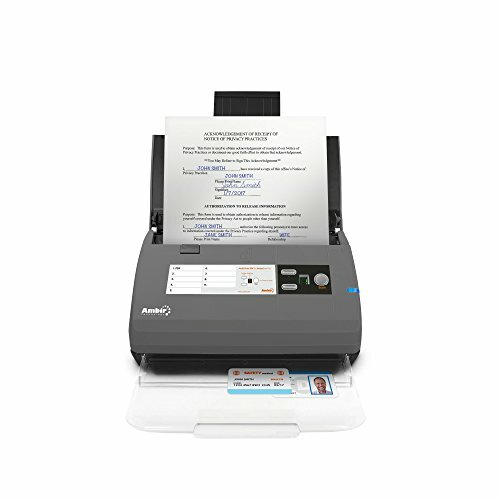 HIGH SPEED DUPLEX SCANNER: Save time by quickly scanning both sides of double-sided documents and cards in a single pass. PROFESSIONAL GRADE BUSINSS SCANNER: Durable and reliable enough for high-volume environments like hospitals, banks and busy points of sale. BROAD COMPATIBILITY: The included enhanced TWAIN driver ensures compatibility with thousands of software applications and hardware systems. If you have any questions about this product by Ambir, contact us by completing and submitting the form below. If you are looking for a specif part number, please include it with your message.